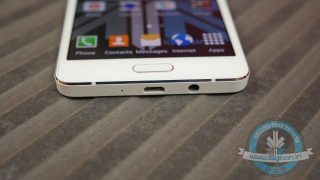 With the launch of the Galaxy Alpha last year, Samsung attempted a new metal frame based design philosophy that also influenced their last major flagship, the Note 4. Samsung recently launched the A3 and A5, which are based on the same design elements, but come with a mid-range price tag. 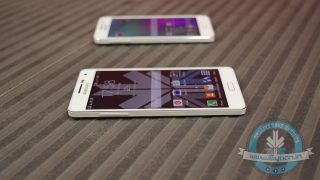 We unbox and take a look at the new Galaxy A5 from Samsung. Except for their display sizes, both the A3 and A5 look identical. 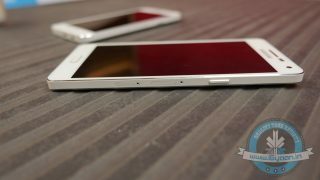 There is nothing on the top as both the microUSB slot and 3.5 mm jack are placed on the lower end. On the right, you have the power button along with two SIM slots out of which the bigger slot can be used as a microSD card slot. On the left, you have the volume rockers and staying true its, ‘Samsungness’, the main button sits at the center below the display along with the capacitive touch buttons. The pearl white color of the device is fantastic. The devices are marketed as selfie and camera friendly and hence provide instant access to the camera from the lock screen. The touch felt responsive, and there were minimal lags in the time of use. The Galaxy A5 has a 1280×720 display which is a dissapointment as Samsung could have easily provided a Full HD display at the price. 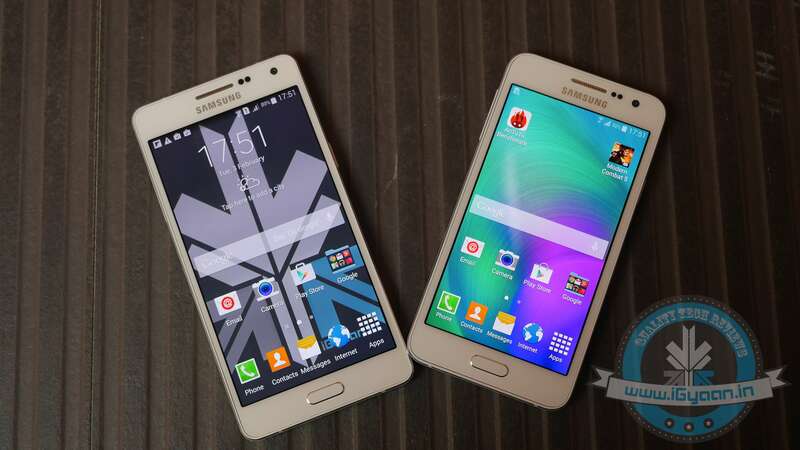 The Galaxy A5 comes for a price of Rs. 25,500 and has more to offer than its younger sibling; the Galaxy A3. Stay tuned for the full review of the devices only on iGyaan.in. I bought Samsung Galaxy on 13th Apr’15. Front camera images were blurred, rear camera colour reproduction was pathetic. A pink shirt looked like grey. Frequent signal drop. I returned this phone and the service representative informed that there is display problem and they would change the dis play. It was hardly a week old and I insisted for a replacement. New sevice was delivered on 5th May’15 and the didn’t provide a standby phone. I got a 4G sim from my service provider. Though, there is network signal if someone calls me, it would give them a message that the phone is switched off. I’m able to make calls but unable to receive at times. This phone has an entry level processor which cannot handle even single simple application. Memory management is poor. Always, 80-85% of memory usage and the applications shut off suddenly. Device hangs frequently. After browsing for 10-15 minutes, the phone over heats to 72 degree, which is unbearable temperature if you want to make calls. They claim that the RAM is 2GB but only 1.85GB is available. Sim 2 slot can either be used for second sim or for memory and not both at the same time. They call it as hybrid sim slot which is utter useless feature. Low light rear camera images are full of noise. Front camera automatically uses beautification even in normal mode so that your face looks like a status made up of Plaster of Paris. No skin tone, texture…It is quite artificial. Battery drains faster and doesn’t last for more than half day for an averge user. A few good thing about the phone is its 125g, 6.7mm thin and the super AMOLED display. Speaker is not loud enough. Music on earphones is horrible when you use Google Play Music but sounds better with Sound Alive. You can buy two other brand phones in the price of this phone with the same specifications. Motion & gesture features are already available in low cost Samsung phones. Samsung Galaxy Apps, Samsung Link, Briefing, Flip board, Ant+, Sound Alive, Weather, Drop box, Google Circles and many applications run in the background by default. There are unwanted apps pre-pre – installed which is the major cause for the sluggish performance. I’m completely disappointed with this product. Samsung promised cashback for this product but it was not credited yet. how is Quad core powered phone by samsung is classified as Mid range? 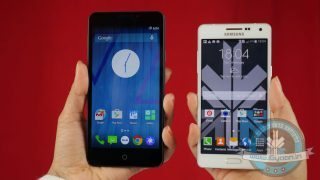 when we have octa core powered phones at that price or below? What exactly places a phone in Mid range? the price or the functionality?